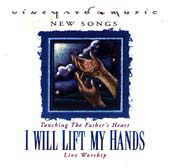 I Will Lift My Hands is already my new favorite CD. It has just the right mix of newer and older songs, but the most exciting thing is the mix of fast and slow praise music. The title song is one that makes it impossible to use it for background music - the hearer must stop and worship along with the song. But my very favorite is Kingdom Celebration. I have never heard a song that just MADE me get up (every time I hear it) and dance with joy to the Lord. Its east coast sound with instruments and beat make this song an absolute joy!